Maybe I should have held off a couple of weeks before remarking on "the influx of topical piety into screen dramas." Lions for Lambs, arriving Friday, brings a veritable tidal wave of piety, topping the combined volume of it in (to rehash and expand the list) A Mighty Heart, Trade, The Kingdom, In the Valley of Elah, Into the Wild, Michael Clayton, Rendition, and any two or three others you'd care to add. 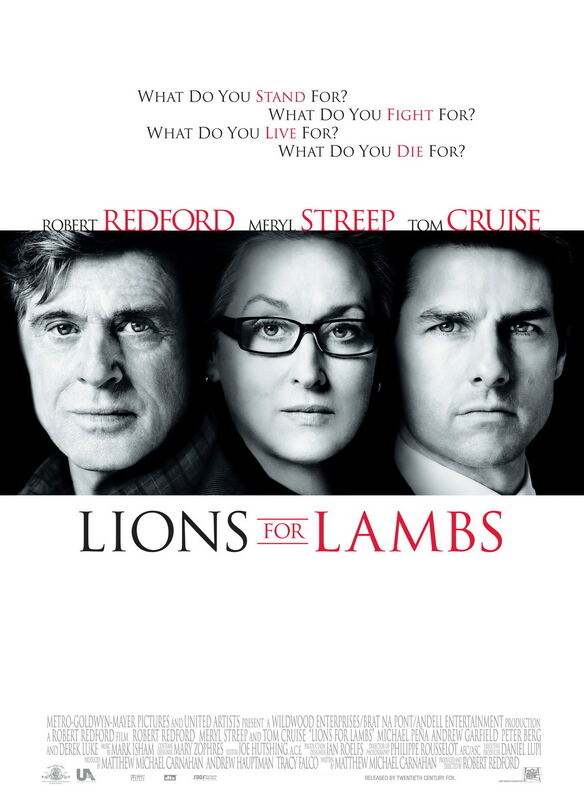 (Screenwriter Matthew Michael Carnahan gets the credit, or the blame, for both Lions for Lambs and The Kingdom, his first two produced scripts.) On second thought, maybe it's better to have done it this way, not so as to make me look prophetic but simply to emphasize that we're still somewhere in the midst of the flood and you'd be advised to keep your life raft and your scuba gear at the ready. The topics on the table, this time, are the war on terror, the lack of a battle plan to wage it, the governmental policy of disinformation, the complicity of the press in all this, the general lowering of journalistic standards, the apathy of the younger generation, the ivory-towerism of academe, and (if that's not enough) the responsibility of each and every individual citizen to get involved, make a difference, act out a slogan. Or as the ad line puts it, stealing a country-western lyric from the lips of Aaron Tippin, "If you don't stand for something, you might fall for anything." Italics -- or rather, different-colored type -- theirs. The C&W singer, in his turn, placed the stress on something and anything, and the variance will have to pass for a fresh spin. The action in the film, which is to say the talk, talk, talk, takes place in three arenas. One is the Capitol Hill office of a go-getter GOP senator, once branded "the future of the party," currently entertaining a veteran newshound in an hour-long one-on-one interview, divulging a new plan for victory in Afghanistan: "My honest effort to keep the press better informed." The plan, however, is not just "off the record" but off the screen and out of earshot, except for the bit about a newly launched military operation, sounding suspiciously like a tried-and-failed strategy in Vietnam, small units of cannon fodder strewn behind enemy lines. The second arena, where the strategic failure receives immediate demonstration, is a snowy Afghan mountaintop on which two old college buddies lie wounded and marooned, with the forces of the Taliban closing in. And the third is the office of their former Poli-Sci professor at "a California university," where he now, conscience-stricken over his vain attempt to dissuade them from joining the military, fights for the soul of a disengaged student of bright promise and smart mouth. The shifting focus from one arena to another, for all its geographical scope, is scarcely cinematic at all, but more like a shifting spotlight on a stage, a pool of illumination that circulates between three distinct twosomes. Although a few flashbacks combat this effect, the staginess -- the soapboxiness -- never for a moment relents. Even the journalist's car ride at the end is not a chance merely to get some air, but a chance to connect the dots from the White House straight to Arlington. The film, really more a forum than a film ("Here we are," the truest statement the senator makes, "having a high-minded debate"), collects commonplace talk on the issues at hand, things you hear spoken all around you these days, and it crams them into the mouths of tenuously connected, sketchily conceived fictional characters. ("Didn't we also arm Saddam in the Eighties?" "How about a strategy to bring the troops home?" "Rome is burning, son." That sort of stuff.) Presented for the most part in a constricted face-shot style, and rather sickly in complexion for so eminent a cinematographer as Philippe Rousselot, it comes to us out of the evident conviction that we are at too critical a time in our history to be bothered with amenities such as art and artfulness, imagination and invention. (Still another indicator, like no shampoo on airplanes, that the terrorists have won.) And -- despite an A-list cast of Tom Cruise, Meryl Streep, and Robert Redford, the last of whom also directed -- it logs in at several ticks under ninety minutes, as if any greater elaboration would have dangerously delayed the delivery of the message. Cruise takes the unappetizing role of the silver-tongued, slick-haired senator (photoshopped, on his office wall, into camaraderie with Bush, Cheney, Condoleezza Rice, Colin Powell, et al. ), seemingly a role right up the alley of so patently phony an actor; and yet a transparent phony playing a transparent phony is perhaps too much phoniness, too much transparency. Here again, the time must have been seen as too critical to bother with little things like ambiguity and subtlety. Streep, sporting a pair of Ashleigh Banfield specs, imparts plenty of shade to her portrayal, apparently having actually convinced herself she was portraying a human being, even though the bare fact that the character is both a leading TV journalist and a leading print journalist unmasks her as an all-purpose representative, an everyreporter. Redford (isn't it strange, isn't it unnatural, mustn't it be surgical, how his eyes grow wider as he grows older?) is the caring professor, and there is no doubting his own or his character's earnestness. His judgment is another matter. A matter almost for criminal prosecution. What else is doing: the organizers of the Latino Film Festival have put together their final monthly program of 2007 at the UltraStar Hazard Center, November 9 through 15, DarkBlueAlmostBlack from Spain and Love for Sale from Brazil, before they then go underground to prepare for their 15th Annual next spring. And a new event self-explanatorily called Horrorfest (not exclusive to San Diego, but simultaneous nationwide) will unveil "8 Films to Die For," November 9 through 18, at the Horton Plaza, Palm Promenade, Chula Vista, and Rancho San Diego. These are low-budget, low-profile, low-recognition offerings about which I can say nothing, other than that the cast of Crazy Eights -- Traci Lords, Frank Whaley, Dina Meyer, Gabrielle Anwar -- ascends, in this company, the closest to stellar. Sept. 14, 2008 @ 10:43 a.m.
Lions for Lambs is one of the most self promotional movies out there. The brain child of Robert Redford and Matthew Michael Carnahan is their own little statement on today's events in their opinion. By the end of this movie which ended abruptly we all just had our mouths open and said "What?" Most everyone didn't have a clue.